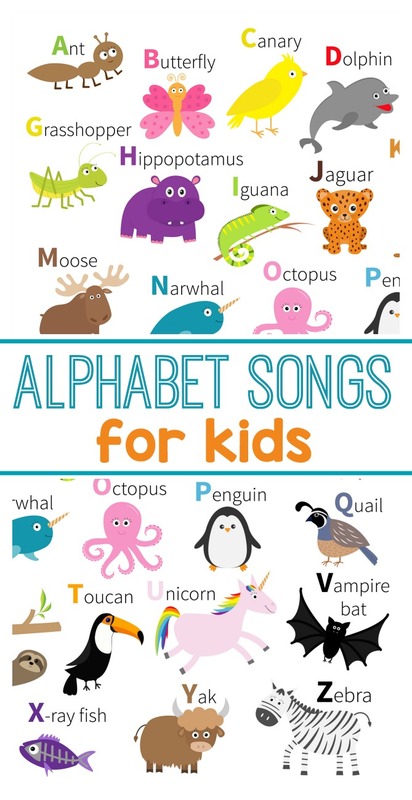 Learning the alphabet can be super tricky, but using something as simple as an ABC song, alphabet song, or alphabet chant can make all the difference! It is important for children to be able to learn letter sounds as well as to know how to recognize and identify letters. Letter knowledge and awareness play a key role in learning to read. Alphabet songs are not only fun, but they are also valuable resources that you can use to help children learn about letters. Learning through song provides the opportunity to experience letters in an entertaining way, while also keeping a fun and gradual pace to the learning process. 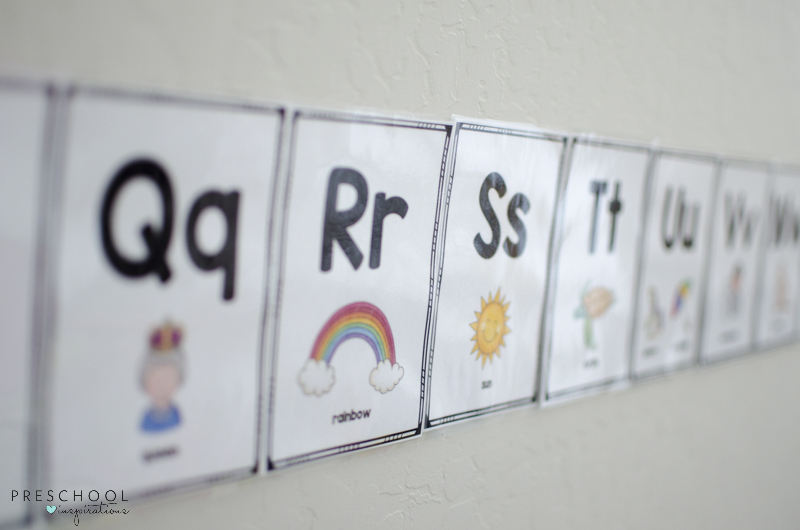 As a preschool teacher of 15 years, something that I also always try to have around is the alphabet at eye level for children. The best are the ones with the uppercase and lowercase letters and a visual to show the child what the letter sound starts with. We love our alphabet posters and cards that I made for the home or classroom. Now, on to the ABC songs that I wish I would have known ages ago! This alphabet song is a great way to work on phonics, American Sign Language, and more! It’s super fun to learn and a little bit addictive to sing throughout the day! This alphabet song is one that kids love to sing over and over again! Jack Hartmann has many alphabet songs, but this is probably our absolute favorite that works on letter recognition and letter sounds. You can even add sign language in too. Dinosaur lovers are going to love this rendition of the alphabet from Dinosaur Train. This episode is specific to the alphabet and keeps kids entertained while helping them learn the letters, letter formation and more. This is a fun and upbeat alphabet song! The song has two parts. One sang by Sesame Street characters and the other sang by Usher. The characters sing the letters themselves while Usher sings words that start with the letters. This helps with learning the letters as well as the beginning sounds. We all know the excitement that Sesame Street can provide for children. When children like a certain character or group of characters, it can help encourage them to want to learn. This video is perfect for that. Who doesn’t like Big Bird and Elmo when learning the alphabet? This is a fun way for kids to hear the letter, hear the beginning sound, as well as see the example of the beginning sound. The three together will really help kids learn and know the ABCs and beginning sounds! I like this particular ABC song because it shows the letters bright, big and bold. This means that kids can see the colorful letters while hearing the sound as well as a word that starts with that letter. The combination is a perfect visual for kids to better understand and learn the beginning sounds! This phonics song shows fun pictures of objects that start with each letter of the alphabet. It also shows an upper and lowercase letter next to the picture. This is helpful for children to make the connection. The song also sings the object’s name, the letter, and reiterates the beginning sound. This video will help children learn letter sounds and practice letter recognition while exercising. This is a perfect indoor activity when kids need to get out the wiggles. This is also great for children for incorporating learning with movement! This is a fun and easy way to practice the ABCs as well as learn the American Sign Language alphabet. This video shows the sign language letter, shows the written letter as well as speaks the letter sound. Learning sign language can not only help with the alphabet but can help build confidence and self-esteem. This is great for combining American Sign Language and the alphabet! Learning a second language, including American Sign Language, is beneficial in so many ways. This song is from Really Rosie, a musical that first aired in 1975. It makes learning the alphabet come alive with this catchy song. The beloved book, Chicka Chicka Boom Boom, takes on new life as a Chicka Chicka Boom Boom song! This song is a great example of combining music and movement! This can help kids get wiggles out while practicing phonics. This is especially helpful for students who need to learn through movement! This is a great example of singing the traditional ABCs to a different tune. This can help children actually learn the letter order, not just the song itself. Plus it’s fun! Turn learning the alphabet into a fun dance with this Reggae mix of the alphabet! Want more ideas and songs?